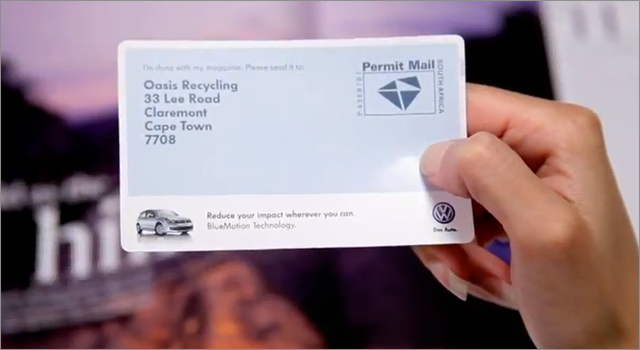 When Ogilvy Cape Town was tasked with creating an ad campaign to introduce South Africans to Volkwagen’s BlueMotion, they took a cue from the eco-conscious mindset behind the technologies. With over 77% magazines being thrown away, how could creating another magazine ad help to save paper instead of wasting it? The agency’s solution was to create a magazine insert that could double as a mailing label. They took the budget that would normally spent on photography or illustration and purchased return postage. Once the reader has finished reading the magazine, they apply the mailing label and drop the magazine into the nearest post office box. The response rate so far has been 9%, and based on that success the agency is looking at rolling the program out to other cities in South Africa.